If you’ve been asked to be a bridesmaid, don’t let the associated costs blindside you. Last year, the average cost of being in a wedding was $703 (not including flights to out-of-town fetes). Wondering if you’ll be able to stand up for your friend without going broke? Read our bridesmaid budget guide to see where you can expect to spend and what you can expect the bride to cover. Photo by Cory Jackie on Glamour & Grace via Loverly. Who pays: Usually the bridesmaids. How much: The average cost is about $200. How to save: Talk to the bride about your budget concerns before she chooses bridesmaids dresses, and rest assured that there are plenty of gorgeous options in the $75 to $100 range. Another easy way to save is to get necessary alterations done by a tailor instead of at the bridal salon. Who pays: It depends. Bridesmaids typically pay for their own accessories, but if the bride is asking you to wear specific shoes, cover-ups or jewels, she will often pick up the check and give those items as a gift. How much: Anywhere from $30 to $200, depending on the styles selected. How to save: If you’re able to wear the accessories of your choice, try to wear something you already have or can borrow from a friend. Otherwise, find something pretty that’s on sale (just make sure you LOVE it before purchasing, just in case you can’t return it later). Second-hand and vintage stores are also great spots for finding inexpensive clutches and costume jewelry. Who pays: It depends. Hosting responsibilities my fall to the bridesmaids, but the bride’s mother or another relative may also jump in to plan and pay. How much: If you’re asked to host, set a budget before you start planning. Consider the cost of the location, food, drinks, and any game prizes when determining the maximum amount you want to spend. And don’t be afraid to ask the other ‘maids to chip in. Most bridesmaids can expect to spend $50 to $100. How to save: If you’ll be expected to contribute, get involved with the shower planning process so you can have a say in the overall budget. Who pays: The bridesmaids, though the bride might cover some of her own costs (like her flight or a portion of the hotel) if it’s a destination bachelorette bash. How much: It depends on the sort of affair you’re putting on, but costs can include everything from your own food and drinks to staying in a rental home or hotel for a weekend (if your friend is particularly fancy). Be prepared to spend at least $60 for this party. How to save: Read our tips for bachelorette party budgeting to try to keep costs down. If you simply can’t afford it, it’s totally okay not to attend. Just be upfront and honest with the bride-to-be! How much: The cost of these florals will vary based on the wedding’s location, the season, and the flowers chosen. 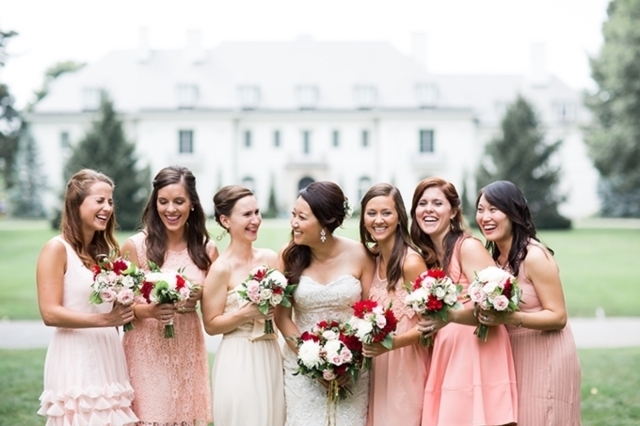 Couples often spend more than $100 per bridesmaid bouquet. How to save: Crafty brides can attempt DIYing their wedding flowers, or for a less hands-on option, they may consider something simple, like baby’s breath bouquets, to help keep costs down. Who pays: It depends; sometimes the bride covers everything, but in other cases, the responsibility falls on the bridesmaids. If you’re worried about it, bring it up with the bride when she asks you to be a ‘maid. How much: The costs will vary depending on where the wedding is taking place (hair stylists and makeup artists in big cities are more expensive than those in small towns), how complex the ‘dos are, and how fancy the wedding is. Expect $50+ per person for each service. How to save: It can be hard to get out of having your hair and makeup professionally done if that’s what the bride wants (and if all the other bridesmaids are participating), so we recommend talking to the bride about this before you’ve committed to being in the wedding to avoid tension later on. Travel to the wedding location. How much: Depending on whether you’re driving or flying, it could be anywhere from $50 for gas to $700 for flights, rental cars or taxis for an international destination wedding. How to save: Start looking at flight costs at least four months in advance and keep an eye out for seat sales. Also, consider splitting a rental car with several people. Accommodations for the wedding weekend. Who pays: It depends. In most cases, bridesmaids are responsible for their lodging the night before and the night of the wedding. But if the bride wants all her gals to stay together the night before (sans dates), she should cover the cost. How much: $100-$200 per night, depending on where you’re staying. How to save: Check home rental sites like Airbnb to find more affordable accommodations. You can also share a room or rental home with other bridesmaids and invited guests to save cash. How much: Depending on the style of wedding, the marrying couple may choose to rent a school bus, a vintage ride, a big ol’ pick-up truck, or a fleet of town cars. Costs will vary widely. How to save: The transportation doesn’t have to be fancy! A rented SUV (with that family member who keeps offering to help with the wedding behind the wheel) can get everyone where they need to be for much less than a limo. How much: Wedding gifts are available at every price point, with most guests spending $30-$109 on the wedding present. But your gift budget may increase rapidly if you’re purchasing something for the engagement party, bridal shower, bachelorette party, AND the wedding. Another factor? How close you are with the couple; in 2016, people spent an average of $127 on a gift for a close family member. How to save: Consider going in on a big wedding gift with the other bridesmaids and stick to smaller (those baking sheets and spatulas the bride-to-be wants) or DIY items (like a scrapbook or photo album) for the other events. And if you simply can’t afford a gift for the other events, just bring a nice, handwritten card. Want more wedding planning help? Get the step-by-step wedding planning guide.